�Tales from the Tread� columns appear in the Steamboat Today the first and third Wednesday of each month. The columns are written by the museum�s Executive Director, Candice Bannister, or a guest author, and feature people, places, and events in Routt County history as well as museum programs and events. Click on the titles below to read the full length articles on the newspaper's website. Click here topmuseum@sprigsips.com to submit story ideas or share your feedback on these columns. On March 29, the Tread of Pioneers Museum partnered with the Community Agriculture Alliance for Agriculture Appreciation Week to feature tasty dishes and fascinating speakers for the museum�s �Taste of History� food series. STEAMBOAT SPRINGS � This week, we celebrate Agriculture Appreciation Week. Most cattle operations in Routt County are cow-calf operations, which means the cow herd is maintained year-round, and a calf crop is sold in the fall. But, there is so much more to it. Let's look at the yearly cycle. In a time when women's roles and adventures were usually quite limited, two Smith College graduates broke the mold and set out from the East Coast on the journey of a lifetime to start a summer dance camp in the Rocky Mountains. Their vision was to join their love of the outdoors with their passion for dance and creativity. To that end, in 1915, Perry-Mansfield Performing Arts School and Camp began in the woods of Strawberry Park in Steamboat Springs. As we move toward March, Women's History Month, we pay tribute to the women of Routt County who carved their own paths and made history in a time and place that made it extremely difficult � and at times impossible. We honor the school teachers and superintendents like Emma Peck, who gave a lifelong commitment to the education and betterment of our children. We remember the leaders in arts and culture like Charlotte Perry, Portia Mansfield, Eleanor Bliss and more. We celebrate the brave and the bold Ida Younger. Take a culinary journey through the past with the Tread of Pioneers Museum in the tasty three-part series, "A Taste of History." We invite you to savor the history and family traditions that are held in family recipes and cooking methods from Routt County. Recipes are an integral part of our heritage as they demonstrate a historical perspective of home life, local agriculture, wildlife and plants, as well as family ties and connections between generations. Sifting through 130-years' worth of Steamboat Springs history in the recently acquired Steamboat Pilot photo and newspaper archive, the Tread of Pioneers Museum uncovered a war story fit for a movie blockbuster. It is the story of U.S. Airman and Steamboat native, Robert Frost Waggoner. Mother-of-pearl buttons, a shard of fine, hand-painted china, a small delicate sole of a shoe. These were the unlikely items found in abandoned mining sites which indicate the presence of women. Images of the artifacts are featured as part of the "Human Imprint" exhibition that opens this week at the Tread of Pioneers Museum. Treasured holiday heirlooms help us celebrate the season and are precious pieces that tell the story of our families. Before or after the holidays is a good time to take a look at how your treasures are displayed or stored. Everyone knows Steamboat Resort opens this week. But what you might not know is that, while you are up there skiing, you can learn more about Steamboat's unmatched Olympic heritage at the Olympian Tribute display on the second floor of Thunderhead Lodge. The trees were decorated by 25 local organizations, artists, clubs and businesses, including Colorado Crane Conservation Coalition, Young Bloods Collective, Elevation Dance Studio, Steamboat Art Museum, Moxie Home Consign and Design, Emerald Mountain School, Holy Name Preschool, LiftUp of Routt County, Yampatika, local Girl Scout troops, the Ladies Recreation Club and more. Leaves are falling, winter is coming and that means it's time for the Tread of Pioneers Museum's 24th Annual Festival of Trees. This locals' favorite holiday tradition transforms the museum into a sparkling forest of beautiful holiday trees and runs 11 a.m. to 5 p.m. Nov. 17 to 26 except Thanksgiving Day. What can be better than craft beer? The perfect pairing of craft beer and fascinating local history. Join the Tread of Pioneers Museum at 5:30 p.m. the first Tuesday of each month, October through April, at the Butcherknife Brewing Co., 2875 Elk River Road, for the popular event series History Happy Hours. The events take the rowdy and raucous side of Routt County history to the community via beloved happy hour. A vital part of Steamboat Springs' history has been saved through the efforts of the Tread of Pioneers Museum and Steamboat Pilot & Today. The museum is proud to announce that it has received the entire historic photograph collection of The Steamboat Pilot newspaper � Steamboat Springs' longest running newspaper and oldest local business, since 1885. After three years of tireless effort, the historic Arnold Barn � standing next to the Meadows Parking Lot � will be moved to its new home at the intersection of Mount Werner Road and Mount Werner Circle this fall. The community partnerships, collaboration and grassroots efforts to set this project in motion cannot be understated. Steamboat Springs' premier historian, Jim Stanko, has served on the local cemetery board for 23 years. He jokes, "there's only one way off the cemetery board." The first Fourth of July celebration in Steamboat Springs took place in 1876, 100 years after America declared independence. Colorado was not yet a state, and only a few permanent settlers lived in or near Steamboat. The town's first settlers, the Crawford family, had probably enjoyed large festivities while living in Missouri, but in 1876, they gathered their few neighbors and the nearby Ute Native Americans to observe the holiday with a simple celebration. Summer is heating up at the Tread of Pioneers Museum. Whether you are new to town or a longtime local, you are sure to deepen your love of Steamboat Springs by digging deeper into the rich history of the area. Tread of Pioneers Museum's events and programs are just the ticket. Still need another reason to go? All programs are free of charge, except the Parade of Homes fundraiser. On May 3, the Tread of Pioneers Museum will proudly host the Ute Indian/Steamboat Springs Cultural Exchange Event. The Youth Leadership Coalition of the Ute Indian Tribe of Fort Duchesne, Utah, will perform powwow dances and music and share the history and meaning of their dances and regalia in four presentations � two for the public at 5 and 6 p.m. May 3 at the Steamboat Springs High School Auditorium and two for Strawberry Park Elementary students on May 4. All of the presentations are free to the public and students, courtesy of the Tread of Pioneers Museum and the Ute Indian Tribe. t never ceases to amaze me the historical treasures that come through the doors of the Tread of Pioneers Museum on nearly a daily basis. Just this month, a document was given to the museum titled "John Warren Richardson's 'Camping in the Colorado Rockies (1898).'" Covered wagons making their way across America's heartland is a recognizable image in our history. With each "white canvas caravan," the tale of settling America's western frontier unfolded, nurtured by the 1862 Homestead Act which allowed any American to put in a claim for up to 160 free acres of federal land. March is Women's History Month. To celebrate, the Tread of Pioneers Museum has hosted an array of programs and events over the years to honor the local women who shaped the history of Routt County. At noon on Friday, Jan. 3, 1931, a lone figure in a long skirt and veil walked into the Bank of Steamboat Springs. When the door opened, and a woman apparently entered, the assistant cashier Miss Frankie Burgess stepped forward expecting to wait on a customer. We usually think of the flu as a fairly mild illness. It strikes every winter, and while it's certainly not fun to catch, most people recover in a week or so. The average death rate of seasonal flu is one tenth of one percent of those who catch it. Marjorie Perry was the sister of Charlotte Perry, co-founder of Perry-Mansfield Performing Arts School and Camp. Among her many contributions to the culture and fabric of Steamboat Springs, Marjorie Perry is credited for being the one to invite Norwegian stone mason and ski jumping extraordinaire, Carl Howelsen, to Steamboat Springs in 1914 after she saw him jumping at an exhibition in Hot Sulphur Springs. Steamboat Springs' Olympic tradition is second to none. Boasting more winter Olympic athletes than any other town in North America, our Olympic heritage runs strong and deep. To honor all of our local Olympians who represent Ski Town USA on the world stage, the Tread of Pioneers Museum creates exhibits and hosts events that celebrate the unmatched Olympic traditions that are the lifeblood of our town. For the upcoming Olympic season, look for these museum events to help you catch the spirit. Take a culinary journey through the past with the Tread of Pioneers Museum in the tasty three-part series, "A Taste of History." We invite you to savor the history and family traditions that are held in family recipes and cooking methods from Routt County. Recipes are an integral part of our heritage as they demonstrate a historical perspective of home life, local agriculture, and family ties and connections between generations. Back by popular demand, the Tread of Pioneers Museum and Chief Theater are partnering up to show professionally-produced films and films from the museum's collection in our annual historical film series. Join once per month at 6 p.m. this winter in the warm and cozy historic Chief Theater for this one-of-a-kind local entertainment. Each film is approximately an hour, and all films are free to the public, though donations are welcome. Just as the cooler weather seems to pull everyone indoors, come out for the Tread of Pioneers Museum's 23rd Annual Festival of Trees pre-holiday tradition. The festival runs November 11-20 from 11a.m. to 5 p.m. daily at the museum. Yampa Valley Bank and Steamboat Ace Hardware are once again showing their continued dedication to our heritage and the museum by generously underwriting all costs for this fundraising event. With our sponsors' support, the Festival is once again free to all Routt County residents. The Tread of Pioneers Museum recently received more irreplaceable treasures capturing Steamboat Springs' rich history: 50 reels of Werner family home movie footage. The films are both 8-mm and 16-mm format, color and black and white, and film content dates between 1950 and 1963. Join the Tread of Pioneers Museum at 5:30 p.m. the first Tuesday of each month, October through April, at the Butcherknife Brewing Co. (2875 Elk River Road) for our most popular event series called History Happy Hours. The event takes the rowdy and raucous side of Routt County history to the community and into beloved happy hour. To sweeten the deal, each attendee will receive one free craft beer compliments of Butcherknife. As the kids get back to school and their lives seem to get busier and busier by the year, we can look back to a simpler time in Routt County history when kids had less toys and after-school activities, no screens or video games, more chores and responsibilities, and the rhythm of life seemed to move at a significantly slower pace. The beloved late rancher, Elaine Gay (1918-2015), was known for many things: conservationist, rancher, historian, community leader, local activist, club member, mother, wife and more. She was known widely as the kindest of women, who personified grace and goodness and left her magnificent mark forever on this valley. The 113th annual county-wide Pioneer Picnic will be held from noon to 2 p.m. Saturday, June 10, at the Steamboat Mountain School, formerly Lowell Whiteman School, located at 42605 Routt County Road 36. The Tread of Pioneers Museum will host this year's event. Guests are invited to bring a favorite side dish or appetizer to share for the potluck lunch. The main dish, desserts and drinks will be provided. The Ute Indians, who call themselves "Nuche," meaning "the people," are Colorado's oldest documented inhabitants. Written historical records indicate specific Ute presence in the Yampa Valley since the late 1500s, though linguistic evidence indicates the 1300s. The Tread of Pioneers Museum has spearheaded an exhibit partnership to celebrate the 50th anniversaries of two of Steamboat Springs� finest institutions: Colorado Mountain College and Bud Werner Memorial Library. The exhibit, �A Legacy of Learning� provides a historical perspective of these institutions, from their founding to the thriving programs and services they provide the community today. �If you could make a good pie, you always had someone who was willing to thresh grain for you, brand cattle for you, or help in the hayfield. Louisville, my hometown, has the Kentucky Derby. New Orleans, the city of my alma mater, Tulane University, has Mardi Gras and Jazz Fest. Mary Crawford King left a written record of the first Christmas gathering in Steamboat Springs in 1877. Those who attended were Mr. and Mrs. James H. Crawford, their children and Mr. and Mrs. S.D.N. Bennett. Back by popular demand, the Tread of Pioneers Museum�s Winter Films Series returns to the historic Chief Theater at 7 p.m. on the second Tuesday of each month December through March. Everyone�s invited to come out of the cold and into the warm and cozy Chief Theater to see all the fascinating films we have in store for you. Colorado�s largest one-day online giving event is coming up, and local nonprofits need your support. On Tuesday, Dec. 6, thousands of donors will #GiveTogether to support Colorado nonprofits, while making a difference in their communities and state. Colorado Gives Day is an annual statewide movement to celebrate and increase philanthropy in Colorado through online giving. Halloween is just around the corner, so what better history to keep alive than the stories of spirits who haunt the historic buildings of downtown Steamboat Springs? The Tread of Pioneers Museum hosts a few ghosts inside our own walls, but many are curious about potential hauntings and ghost stories of our town. Steamboat Springs � Steamboat Springs is well known for its distinctive western hospitality, where real-time cowboys co-mingle with Olympic skiers. The connection between our ranching and skiing heritage is authentic � evident more than a century ago when Carl Howelsen introduced recreational skiing to this agricultural community. Join the Tread of Pioneers Museum at 5:30 p.m. the first Tuesday of each month at Butcherknife Brewery, 2875 Elk River Road, for a new event series titled �History Happy Hours.� The event takes the rowdy and raucous side of Routt County history out to the community and into a beloved happy hour. To sweeten the deal, each attendee will receive one free craft beer, compliments of Butcherknife Brewery. Since 1894, the stately stone mansion at 1184 Crawford Ave. has withstood the test of time, proudly perched on the hill that overlooks downtown Steamboat Springs. It stands as a testament of the strength and fortitude of Steamboat's founders, the Crawford family. On the 17th of February (1890) last, I started from my cabin at the foot of Storm Mountain to make a trip to the top to see if the fur-bearing animals were still out. It is only about 10 miles to the top, and I reckoned that I could easily make it there and back in a day. Packing a slight lunch, I tied it in my belt and started. In 1873, the James H. Crawford family loaded up their wagons in Sedalia, Missouri, and headed to Colorado in search of a new life in the area that would eventually become Steamboat Springs. The first one-room schoolhouse in Routt County was a cabin owned by the Crawford family, and the last was the Mesa Schoolhouse. Although the Crawford cabin is long gone, the 100-year-old Mesa Schoolhouse still stands on the west side of Highway 40 south of Steamboat Springs. Roland McCook Sr., great-great grandson of Chipeta, the wife of Ute Chief Ouray, is dedicated to telling the story of the Ute Nation. After living on a Utah reservation for most of 66 years, he made his home in Colorado. The public is cordially invited to the �Two Friends Meet� exhibit opening reception from 5 to 8 p.m. May 6 at the Tread of Pioneers Museum. The event is part of the First Friday Art Walk downtown, and the exhibit features fine art prints depicting local rancher Vernon Summer by watercolor artist Gary Hawk. As the younger generation takes over and many of us (has beens � the top hands of yesterday) fade out of the picture, let us hope and pray that this vast domain the pioneers loved so dear will be the heritage of our children and grandchildren to enjoy on down through the ages. The Tread of Pioneers Museum was named after the book, �The Tread of Pioneers,� copyright 1945, by Charles H. Leckenby, longtime editor and publisher of the Steamboat Pilot. A man of the written word, Leckenby was compelled to record the facts and stories of the first 75 years of history in Steamboat Springs through his bird�s-eye-view publishing the newspaper. When you hear the term, �Wild West,� what comes to mind? For many, the Wild West describes the raw and untamed life in the Western part of the United States around the end of the 19th century. During this time, settlers were moving west, where the land was rough and rugged, and life was hard. Picture this: It�s the 1930s, and you have just been hired to teach in a one-room schoolhouse called Moonhill somewhere near Clark, Colorado. In honor of the 103rd Winter Carnival, I dug into the depths of the Tread of Pioneers Museum�s rich archive and the Steamboat Pilot newspapers to share with you some of the articles describing the first Winter Carnival events that would form the foundation of a century-long tradition and an iconic symbol of the spirit of our ski heritage in Steamboat Springs. Historic cookbooks and recipes provide a unique glimpse into the lives of Colorado�s early pioneers. In comparison to today�s diverse cuisine, frontier recipes featured relatively plain foods, since few spices were available. Pioneer menus varied depending on the location and the season. Most pioneers raised livestock or hunted to ensure an adequate supply of meat. The Yampa Valley has lost an incomparable legend � one of the greatest and most influential champions of conservation that this valley has ever seen. We owe much of the modern feel of the valley to the way this rancher fought for the landscape. She defined integrity. Time spent hearing feisty arguments and old-timer stories at her kitchen table is among my most precious memories. Elaine, you leave a hole in our collective heart. As the traditions of the holiday season draw near, we hope everyone will participate in a local favorite. The 36th annual Yule Log Hunt, sponsored by the Tread of Pioneers Museum and the Steamboat Springs Chamber Resort Association, begins Monday, Dec. 7. Each weekday, a new clue will be printed in the Steamboat Today and air on local radio stations. Combine the words snow and surfing and you get �Snurfing.� This is exactly what Nancy Poppen did in 1965, when her husband, Sherman Poppen, presented a handmade Christmas gift of two skis fixed together to his 10-year-old daughter. On Sunday, a duo of historians with deep Routt County roots were the recipients of the Leckenby and Larson awards given annually by a committee of the Tread of Pioneers Museum. I had the distinct honor and privilege of attending the Milk Creek Battlefield Park dedication Sept. 26 in Meeker. This site is best known as the place where Maj. Thomas T. Thornburgh was killed along with other soldiers in a battle with the Ute Indians from Sept. 29 to Oct. 5, 1879. Less known is the circumstances that led to this battle and the catastrophic losses sustained by the Ute people, losses that went far beyond the tragic deaths during those infamous days. 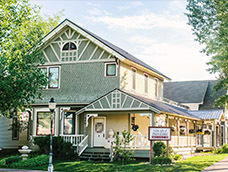 The Tread of Pioneers Museum�s mission is to promote an understanding and appreciation of the history of the Steamboat Springs area by collecting, preserving, exhibiting, interpreting and sharing that history and heritage. At the heart of our mission is preservation, but what does it mean to preserve history? In 1986, the Tread of Pioneers Museum was given a rather odd gift from Guthrey Drake. The gift was a human tooth � a gold tooth, to be exact. Guthrey Drake�s father, George Drake, we are told, found the tooth in 1900 while he was searching for gold as a prospector in Hahns Peak. On July 24, Tread of Pioneers Museum staff and board of directors dedicated the museum�s community room to James L. (Jim) Crawford and Anna Fang to recognize their continued support and contributions to the Tread of Pioneers Museum and our local history. The event also served as a surprise exhibit opening reception featuring the �Art of the Crawfords,� located in the newly dedicated room. Many of us have basements or attics or closets full of old �stuff.� Most often these things are only meaningful to the owner and would be considered junk to anybody else. But occasionally a gem is revealed. Haybro, Juniper, Edna, Keystone ... If you are new to the area, these names might not mean much to you. But to long-time residents and natives of Routt County, they harken to a coal mining era that defined the region for many years. Do you know the history of your childhood home? Could you describe how they celebrated holidays; what pioneer children contributed to the economy; and, who influenced the town�s creation? An initiative still in its infancy called "My Place, My Home" is designed to connect local kids to these local stories. Once a staple of a woman�s wardrobe, the apron has evolved into more of an accessory. Memories of Thanksgiving dinners conjure up images of roast turkey and pumpkin pie lovingly prepared by grandma wearing her best holiday apron. Potholders and towels have replaced the apron, but for years, it was an essential part of every kitchen. Housewives not only wore aprons to protect their clothes, but also used them as an essential tool for taking hot food out of the oven, carrying fruits and vegetables, wiping dirty hands, drying dishes, and even adding a splash of style to an otherwise drab outfit. In 1908, Earnest Campbell built the Queen Anne style house with unique half-timbered gables on 5th and Oak streets. In 1914, Campbell sold the house to Edward H. Zimmerman, manager of the local Mutual Telephone Exchange and later the Yampa Valley Mill and Elevator Company. Edward and Mary Zimmerman had four children: Herman, Mary, Zelma, and Muriel. The family lived in the house until 1956, when the county purchased it. As the ski season cools down this April, major skiing related events are just about to heat up all over town. The U.S. Ski and Snowboard Hall of Fame, in coordination with the International Ski History Association, will present Skiing History Week Monday through April 12 in Steamboat Springs. Agriculture Appreciation Week, March 22 to 29, is a time to recognize and celebrate the importance of agriculture. Steamboat Springs � In celebration of Women�s History Month in March, this article features an extraordinary woman in Steamboat Springs history � trailblazer Eleanor Bliss. Candice Bannister created this first-person narrative adaptation using the writings of Glenn Poulter and Christine McKelvie. Louisville, my hometown, has the Kentucky Derby. New Orleans, the city of my alma mater Tulane University, has Mardi Gras and Jazz Fest. In 1889, Austrian immigrant John Summer moved his large family from Empire, Colorado, to a homestead in the small town of Sidney, 8 miles south of Steamboat Springs. At that time, the town of Sidney consisted of a saloon, a post office and a few cabins. Howelsen Hill Ski Area is turning 100 years old this year � what a remarkable heritage to celebrate. Steamboat Springs � For more than 50 years, skiers from all around the world have traveled to Steamboat Springs to experience our Champagne Powder, but Storm Peak was not the first ski mountain in Northwestern Colorado. Steamboat Springs � Within 20 seconds of viewing historic footage, a newfound appreciation of Ski Town USA is unearthed. The Tread of Pioneers Museum�s 2014 Brown Bag Summer Lecture Series is up and running and is sure to deepen your love of Routt County. In the days before Steamboat Springs had a rodeo arena, Routt County�s earliest cowboys often had to rope calves and �break� horses that were not keen on humans riding on their backs. Maybe you recently moved here. Maybe you were born here. Maybe you transplanted here and are sinking in roots. Maybe you live here seasonally. Maybe you live farther away and commute here. Colorado�s 10th Mountain Division,� opens to the public May 29. The �Lost Steamboat� exhibit now is open to the public at the Tread of Pioneers Museum. The display features historical photographs of significant buildings that are no longer standing. Whether lost through fire, demolition or remodel, the buildings were an important part of the fabric of our community. Did you know that even with our short growing season, the strawberry business flourished in Steamboat Springs between 1900 and 1916? It all started in 1900, when Lester Remington grew the soon-to-be-famous Remington berry on his land in the area now known as Strawberry Park. Last year, the Tread of Pioneers Museum completed its most significant project to date. The 4,200-square-foot museum expansion project provided a museum-quality collections facility for our growing collection, along with additional exhibit space for the compelling stories of our community�s heritage. Beginning in 1918, Margaret Duncan Brown ranched alone for 47 years in the Elk River Valley of Routt County. Brown�s �indomitable spirit, her great sensitiveness, perception and philosophy of life� live in her diaries that are the foundation of the book "Shepherdess of the Elk River Valley." Steamboat Springs � We hope you were able to join us at the Tread of Pioneers Museum during our grand opening last year to see the new facility that the community helped us build.